A year ago today, I started making Christmas cookies, put the dough in my fridge to get it ready for rolling. Then I did a load of laundry — I’d needed to, for a while, but focused on just darks, in case I needed to pack. In case I needed to pack for funerals. And then I woke up the next morning and started checking my email obsessively, my work mail already forwarding to my Gmail, so I wouldn’t miss it like I’d missed the phone call on Friday afternoon. It came while I was on the 88 bus, back from the Tea Party Museum and lunch at Flour. I called Sarah, made plans, got in my car and went to Target, buying a new notebook, pencils — in case I was going to be outside –, Advil and tissues. Before we had, I took my cookie dough out of the red melamine bowl, wrapped it in Glad Press and Seal and stuck it in the freezer. I sent out a Facebook message, tentatively cancelling a Christmas gathering I had planned for that Wednesday. I didn’t know when I’d be home. We drove through the rain, saving receipts at tolls, refreshing Apple Maps, looking up the NPR affiliate for each region we drove through, trying to guess which station was closest without knowing Connecticut geography. We showed up first at the newsroom and were directed back to the highway, toward the hotel. The directions didn’t make sense. We couldn’t find anywhere to stop for food along the way, but we couldn’t eat, so it didn’t matter. The next night, coming back from a Monroe Town Council meeting, we were starving, but the hotel restaurant had stopped serving. We ate untoasted plain bagels and Nutrigrain bars from the Shakespeare Room, and candy canes. Candy canes and Advil and plates of soggy room service fries, passed around the table in a hotel suite, transformed into a five-person work station with laptops and chargers and Heritage Hotel notepads and cell phones that would ring when someone else left a funeral or couldn’t get close enough at a wake. Someone handed me one last candy cane when I left, and I kept it in the pocket of my pea coat for at least a month after. It’s on my bookcase now. I haven’t eaten a candy cane since. I haven’t listened to Silent Night, either, not since it played at so many memorials and individual funerals. @katielannan @bendoody @nhregister The weeks leading up to Christmas will always be filled with thoughts of Sandy Hook. We came back Wednesday night and were told to take Thursday off. I slept until afternoon and then spent the rest of daylight baking cookies, the dough now a little too firm after almost a week in the freezer. 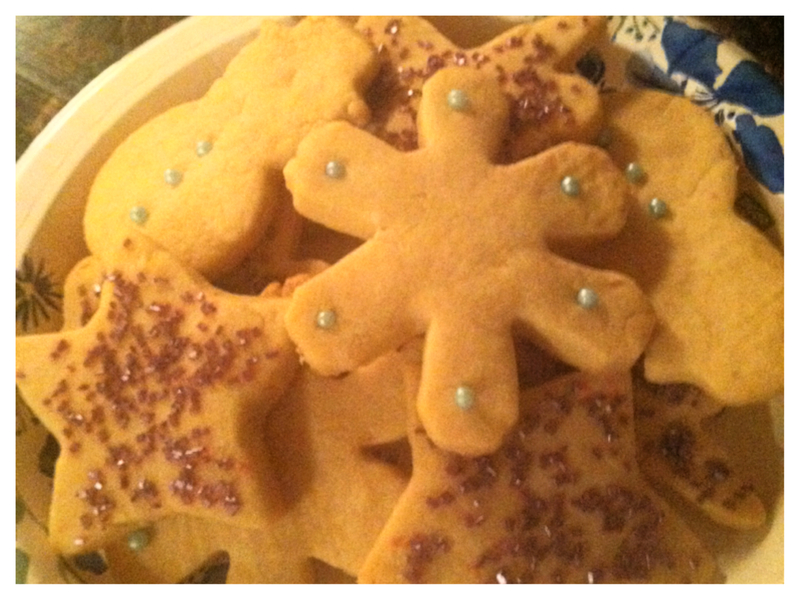 I had a set of Christmas cookie cutters, trees and stars and snowflakes and reindeer. It’s not a full set anymore. I threw out the angel-shaped one, because looking at it made me cry. Someone had decorated the tree in our hotel lobby with paper angels — six big angels, 20 little ones. One in a nationwide chorus of pop-up memorials featuring 26 angels. I have a stick of butter on my kitchen counter right now, warming to room temperature, and in a minute I’ll hunt down the baking powder and sprinkles and my new hand-me-down mixer and the handful of cookie cutters that don’t make me cry. I’m going to cry anyways. Christmas last year was a haze. But I get it back this year, mostly, picking out the perfect presents for the people I love, hanging an ornament from each family vacation on the fir tree in my parents’ living room, baking my favorite sugar cookies in festive shapes. And in my heart all season will be the at least 27 families for whom the meaning of the winter holidays — to say nothing of the experience of daily life — has been forever altered. The parents of James, Charlotte, Daniel, Jessica, Caroline, Olivia, Catherine, Josephine, Dylan, Chase, Jesse, Ana, Emilie, Madeline, Noah, Avielle, Jack, Allison, Grace and Benjamin. In Connecticut, New York, Utah and wherever else they are, there are at least 27 families for whom the peace and cheer we wish each other this time of year no longer has the same meaning. Christmas has always been one of my favorite holidays because everyone goes out of their way to be nice to each other, because everyone’s happy for about a whole month. Everyone acts like a six-year-old in the best possible way, everyone loves. What if we tried that all year?